Three cheers to L’Entente founder Oliver Woodhead for having arrived at such an apt name for his curiously dainty, all-day- service “British brasserie” near Opéra. An entente is a diplomatic understanding between nations; any understanding, of course, is what British and French cultures have notably failed to acquire of one another over the last thousand years. Enter Woodhead, whose effective, if slightly pandering style of restaurant diplomacy was honed by long experience at quality-conscious Left Bank tourist destinations Fish and Semilla. 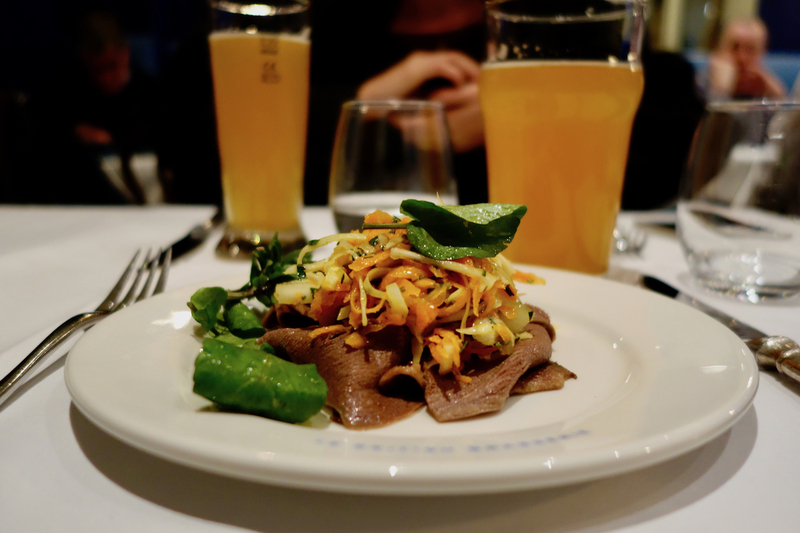 A brasserie on a bistrot scale, L’Entente boasts a well-appointed bar area, a slim terrace, and two brow-knittingly unequal dining rooms, the one by the door being far less densely packed with tables. L’Entente’s visual design is a perplexing colonialist fantasy, awash in robin’s-egg blue and enlivened with safari-themed wallpaper trim, images of tigers, and servers sporting blue Nehru jackets. As if to neutralize this, well, interesting choice of historical iconography, “Sing A Song of Sixpence” is inscribed on one wall in gold lettering. 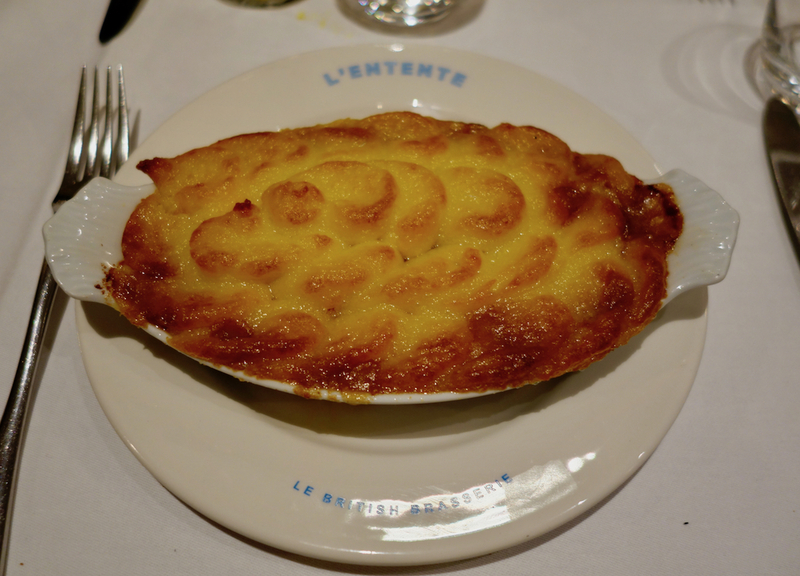 L’Entente’s founding proposition is to source English recipes with fine French ingredients. Good sourcing, alas, couldn’t save the under-seasoned ox tongue salad, nor some almost flavorless Scotch quail eggs. 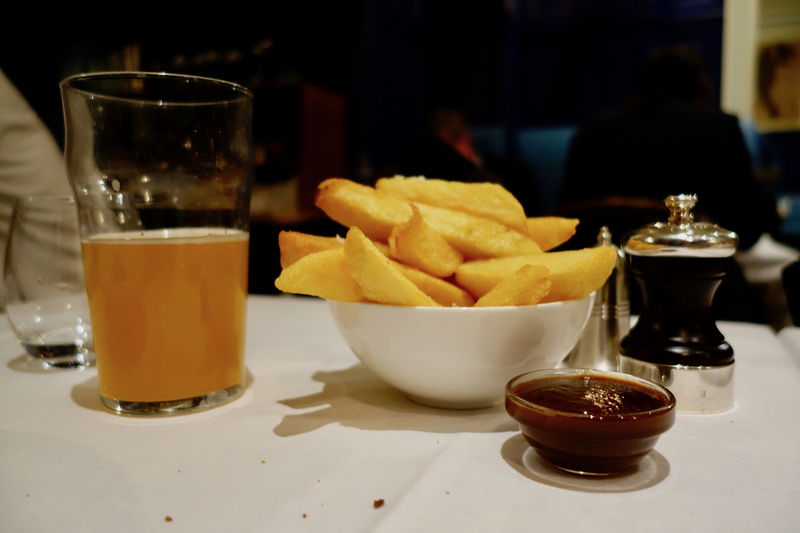 More successful are the restaurant’s gargantuan fries, each the size of a roofing beam, and the shepherd’s pie, a harmonious execution that transcends the genre of hachis parmentier. Chef Matt Ong (from the now closed Brit-themed restaurant Albion) prepares workmanlike British comfort food that any pub-goer would pounce upon. But in L’Entente’s over-lit subcontinental tearoom interior, these staples have an uncomfortably ironic aftertaste; one feels vaguely like the subject in Pulp’s “Common People.” The wine list gives no indication of Woodhead’s experience at more wine-savvy restaurants; for now it is a conventional hodgepodge of mass-market selections one might find at a family restaurant in the UK. Beer, perversely, comes not from the UK but from Brasserie de la Pigeonelle, a rustic Loire-based brewery whose chief supporters are the natural winemakers whose wines are entirely absent from L’Entente’s list. Aspects like this make one suspect L’Entente is not yet making the most of its cultural exchange. The restaurant’s central location and all-day, seven-day service should make it a fine standby for French theatergoers and office workers. 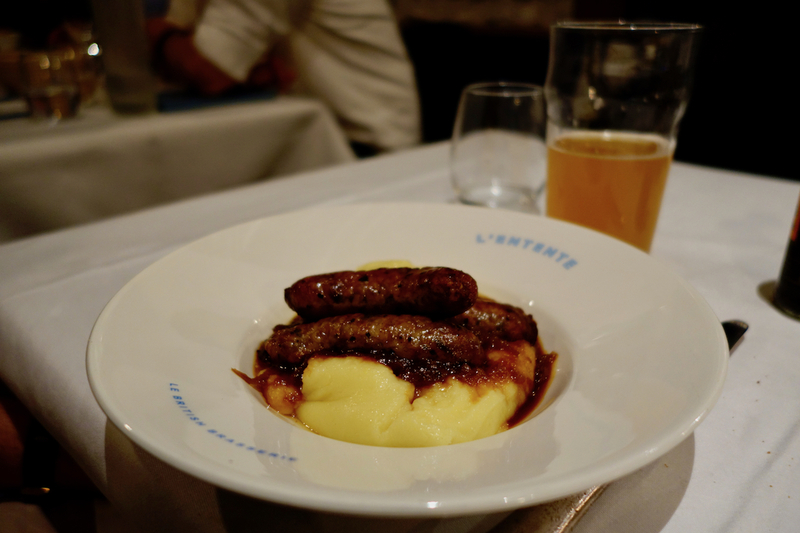 But in recreating a London dining experience, L’Entente has foregone the more recherché wine and cuisine that are the hallmarks of great restaurants in Paris. To draw Anglophones – or any discerning French diners, for that matter – the restaurant must do more than propose British dishes; it must reinvent them. Le Monde (2018) François Simon swoons for the savory pies, filled with lamb and vegetables and a slow simmered sauce. He also raves about a dessert of lemon posset and is snared by a basil and cucumber martini. L’Express Styles (2018) calls this a diplomatic rapprochement: English recipes, but French ingredients. Le Figaro (2018) says British cuisine tries a new breakthrough in the heart of the capital, with heavy reinforcements of toast, pies, and minced meat.